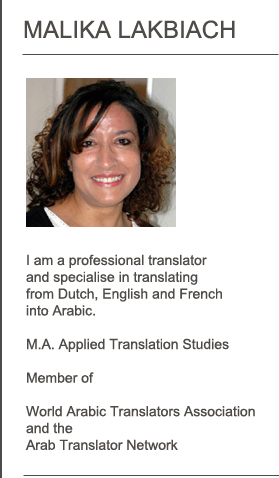 Malika is the founder of Focused Translation, a Project Manager, and a Freelance Translator with many years' experience. After completing a Baccalaureate in Modern Languages and Literature in Morocco, she moved to the Netherlands where she studied, worked and lived for nearly twenty years. Following a BA in Social and Legal Services obtained from the Institute for Higher Professional Education in the Netherlands, she worked as a Citizen Adviser for nearly ten years, dealing with legal and social services issues. During this time she acquired a comprehensive grasp of the systems and their associated terminology and writing styles. She now lives in the United Kingdom and is a fully qualified translator in possession of a number of professional qualifications, including a Master's Degree in Applied Translation Studies. In 2008 she went on to establish a team of expert translators to offer customized linguistic solutions in a range of languages and disciplines. The team has, since, translated and reviewed millions of words to our clients' great satisfaction.